JENNIFER AMOR is an internationally-known quilt artist, teacher, author and designer. A faculty member at such shows as the National Quilting Association (NQA), the American Quilters' Society (AQS) and International Quilt Association (IQA) Festival in Houston, TX, she has taught at quilt conferences, guilds and stores nationwide for more than 30 years. Jennifer's lifelong interest in fashion design led to her being a featured designer for the AQS fashion show, the Fairfield Fashion Show and the Bernina Fashion Show. 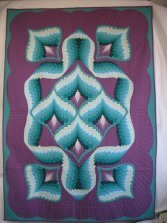 Her quilts, wearables, patterns and quilting articles have been featured in numerous books, magazines, catalogs and calendars. Jennifer's classes in wearable art, non-traditional techniques, machine cutwork and bargello led to the founding of Jennifer Amor Designs to produce and market her unique jackets, wall hangings and bags in pattern form. Her background as a newspaper journalist and her love of art make a perfect combination for producing thorough, easy to understand pattern directions filled with useful sewing tips and shortcuts. Jennifer maintains a busy travel schedule, both as a teacher and a vendor at quilt shows around the country. With her best friend and fellow-designer Eileen Sullivan, she can be found with their original creations in The Designers' Workshop booth at most major shows. Jennifer firmly believes that learning should be fun, so laughter is an essential part of every class. What people say about Jennifer "The women were ecstatic" , "One of the best classes I've ever had, and the most fun. You are a terrific teacher! ", "Your lecture was a true delight, exactly what we needed. All of us appreciate the chance to laugh at ourselves a bit. ", "Wow! We feel WOWED! Your class was a triumphant success. ", "The workshops were outstanding! We laughed and learned and many of us wanted to work through lunch and stay lat e. I can't count the number of times I heard 'This is fun!' And it was."